I was able to travel to Las Vegas as my last stop of a busy college season to cover the inaugural Vegas 16 Tournament held at the gorgeous Mandalay Bay resort. Bd Global did a tremendous job branding and showcasing the tournament and securing solid teams and some big time talent. The PG play in the tournament was the real story with talented guards such as Trey Freeman (ODU), Ge’Lawn Guyn (ETSU), Alex Hamilton (LA Tech) and Key Felder (Oakland) to name a few. Below I have given my All-Tournament Team which is based strictly on Tournament play (regardless of position) along with my MVP. ODU was able to win the tournament behind Trey Freeman’s solid play throughout and that is why he gets MVP. 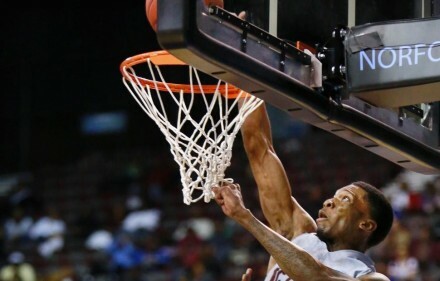 Freeman was able to punctuate a spectacular season by leading his team to the championship by doing what he has been doing all year, scoring the ball at a high rate. He is very efficient with or without the ball in his hands and is one of the best in the country moving without the ball and hitting the midrange jumper. His high release allows him to get his shot off against anyone. He doesnt turn the ball over and rebounds the ball very well for his position. This was my first time seeing Felder all season although I had heard a lot about him. He helped lead Oakland to the championship game where they came up just short against a talented ODU team. Felder is small in stature, but is super aggressive, athletic, and explosive. He can fill it up from behind the arc and is not afraid to drive into the paint. He can break down his defender at will and is a tremendous passer and playmaker. Loved his energy and overall play this tournament. The Cincinnati transfer had a superb game in the opening round and had more energy and a higher motor then anyone I saw. He is highly aggressive on both ends and hits the 3 enough to where you cant leave him open. Rebounds outside his area. Played 2 good games and 1 great game in the semi final round. Was close in my mind for getting MVP. Made good decisions when he was the PG and also showed he could score the ball at a high clip on and off the ball. Was on fire from behind the arc and the 1-2 punch that him and Freeman provided is why ODU won the tournament. While this All-Tournament team and the tournament all together was guard dominated, Stith gets a mention because of his rebounding and solid inside play. He came up big and with his best game in the tournament by registering a double-double. Strong frame who plays w/ energy and rebounds.